This outstanding example of a 2016 Ford Escape SE is offered by Blackstock Ford Lincoln. This Ford Escape SE is an incredibly versatile vehicle that is a "must have" for any family. This 4WD-equipped vehicle will handle beautifully on any terrain and in any weather condition your may find yourself in. The benefits of driving a 4 wheel drive vehicle, such as this Ford Escape SE, include superior acceleration, improved steering, and increased traction and stability. 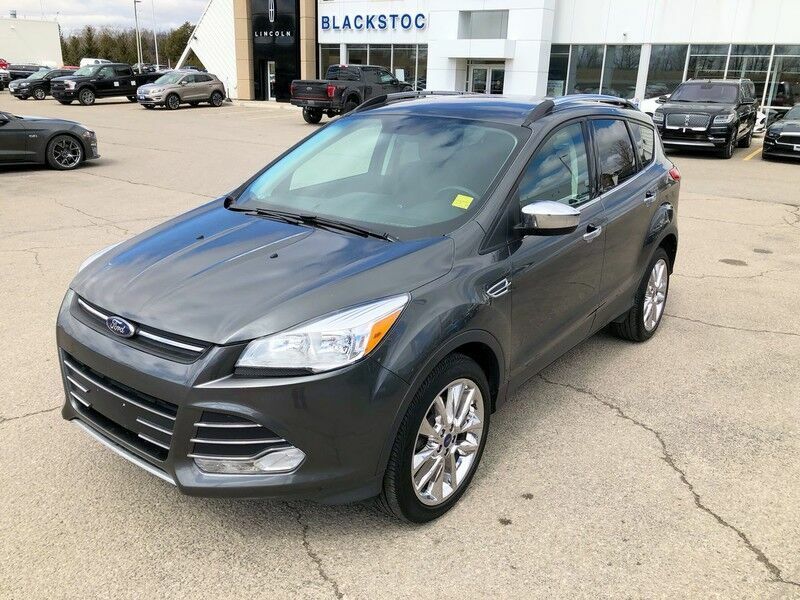 There are many vehicles on the market but if you are looking for a vehicle that will perform as good as it looks then this Ford Escape SE is the one! You could keep looking, but why? You've found the perfect vehicle right here. WHY BUY FROM BLACKSTOCK FORD LINCOLN Our motto is "You Drive Us To Be Different" What does different mean? Live Market pricing competing fairly with integrity Readers Choice Multiple Year Winner Best New Car Dealer, Used Car Dealer, Auto Service Centre for Dufferin County The purchase price is just the beginning. We do not sell or recommend Protection Products that do not have integrity. We do not sell Rust Modules, only Rust Check Spray. The products we do offer, we do not hire third parties. We are direct and approved centre for 3M Paint Protection Film and Ceramic Window Tint. GTechniq Smart Surface Science for Paint and Interior Surfaces We do not sell any product or warranty that we have a hidden ownership stake in. Financing and Leasing Solutions that offer the best rates available that treat everyone fairly and with integrity. Used Vehicle Reconditioning that goes well beyond safety standards. Example brakes with at least 40% wear remaining (Certified Pre Owned 50%). We only offer Extended Service Plans from Ford Motor Company. FINANCING AND CREDIT - Our credit team will work hard to secure you the most favourable terms for you. Your privacy is assured and regardless of your credit rating , simply click the Get Financing Button for a pre-approval quickly and easily. Everyone who handles your application is licensed by OMVIC , the Ontario Motor Vehicle Industry Council. Blackstock Ford Lincoln is excited to offer this 2017 Ford Flex. The Ford Flex is the benchmark all other SUVs strive to meet. With exceptional power, towing and handling, this SUV can handle anything thrown at it. This Ford Flex Limited is for the discerning driver who demands the utmost of his vehicle. All-wheel drive means peace of mind all the time. This White AWD Ford enjoys a host offeatures, including exceptional acceleration and superior stability so you can drive with confidence. The quintessential Ford -- This Ford Flex Limited speaks volumes about its owner, about uncompromising individuality, a passion for driving and standards far above the ordinary. WHY BUY FROM BLACKSTOCK FORD LINCOLN Our motto is "You Drive Us To Be Different" What does different mean? Live Market pricing competing fairly with integrity Readers Choice Multiple Year Winner Best New Car Dealer, Used Car Dealer, Auto Service Centre for Dufferin County The purchase price is just the beginning. We do not sell or recommend Protection Products that do not have integrity. We do not sell Rust Modules, only Rust Check Spray. The products we do offer, we do not hire third parties. We are direct and approved centre for 3M Paint Protection Film and Ceramic Window Tint. GTechniq Smart Surface Science for Paint and Interior Surfaces We do not sell any product or warranty that we have a hidden ownership stake in. Financing and Leasing Solutions that offer the best rates available that treat everyone fairly and with integrity. Used Vehicle Reconditioning that goes well beyond safety standards. Example brakes with at least 40% wear remaining (Certified Pre Owned 50%). We only offer Extended Service Plans from Ford Motor Company. FINANCING AND CREDIT - Our credit team will work hard to secure you the most favourable terms for you. Your privacy is assured and regardless of your credit rating , simply click the Get Financing Button for a pre-approval quickly and easily. Everyone who handles your application is licensed by OMVIC , the Ontario Motor Vehicle Industry Council. Thank you for visiting another one of Blackstock Ford Lincoln's online listings! Please continue for more information on this 2011 Ford Flex SEL with 144,817km. The Ford Flex SEL will provide you with everything you have always wanted in a car -- Quality, Reliability, and Character. Look no further, you have found exactly what you've been looking for. This Blue Ford is clean and shiny exterior makes it look like it came straight from the factory. Driven by many, but adored by more, the Ford Flex SEL is a perfect addition to any home. WHY BUY FROM BLACKSTOCK FORD LINCOLN Our motto is "You Drive Us To Be Different" What does different mean? Live Market pricing competing fairly with integrity Readers Choice Multiple Year Winner Best New Car Dealer, Used Car Dealer, Auto Service Centre for Dufferin County The purchase price is just the beginning. We do not sell or recommend Protection Products that do not have integrity. We do not sell Rust Modules, only Rust Check Spray. The products we do offer, we do not hire third parties. We are direct and approved centre for 3M Paint Protection Film and Ceramic Window Tint. GTechniq Smart Surface Science for Paint and Interior Surfaces We do not sell any product or warranty that we have a hidden ownership stake in. Financing and Leasing Solutions that offer the best rates available that treat everyone fairly and with integrity. Used Vehicle Reconditioning that goes well beyond safety standards. Example brakes with at least 40% wear remaining (Certified Pre Owned 50%). We only offer Extended Service Plans from Ford Motor Company. FINANCING AND CREDIT - Our credit team will work hard to secure you the most favourable terms for you. Your privacy is assured and regardless of your credit rating , simply click the Get Financing Button for a pre-approval quickly and easily. Everyone who handles your application is licensed by OMVIC , the Ontario Motor Vehicle Industry Council. Thank you for your interest in one of Blackstock Ford Lincoln's online offerings. Please continue for more information regarding this 2016 Ford Focus SE with 34,447km. One of the best things about this Ford Focus is that it has low, low mileage. It's ready for you to truly break it in. This is about the time when you're saying it is too good to be true, and let us be the one's to tell you, it is absolutely true. There are many vehicles on the market but if you are looking for a vehicle that will perform as good as it looks then this Ford Focus SE is the one! This Red Ford is clean and shiny exterior makes it look like it came straight from the factory. WHY BUY FROM BLACKSTOCK FORD LINCOLN Our motto is "You Drive Us To Be Different" What does different mean? Live Market pricing competing fairly with integrity Readers Choice Multiple Year Winner Best New Car Dealer, Used Car Dealer, Auto Service Centre for Dufferin County The purchase price is just the beginning. We do not sell or recommend Protection Products that do not have integrity. We do not sell Rust Modules, only Rust Check Spray. The products we do offer, we do not hire third parties. We are direct and approved centre for 3M Paint Protection Film and Ceramic Window Tint. GTechniq Smart Surface Science for Paint and Interior Surfaces We do not sell any product or warranty that we have a hidden ownership stake in. Financing and Leasing Solutions that offer the best rates available that treat everyone fairly and with integrity. Used Vehicle Reconditioning that goes well beyond safety standards. Example brakes with at least 40% wear remaining (Certified Pre Owned 50%). We only offer Extended Service Plans from Ford Motor Company. FINANCING AND CREDIT - Our credit team will work hard to secure you the most favourable terms for you. Your privacy is assured and regardless of your credit rating , simply click the Get Financing Button for a pre-approval quickly and easily. Everyone who handles your application is licensed by OMVIC , the Ontario Motor Vehicle Industry Council. Contact Blackstock Ford Lincoln today for information on dozens of vehicles like this 2016 Ford Focus SE. You could keep looking, but why? You've found the perfect vehicle right here. There are many vehicles on the market but if you are looking for a vehicle that will perform as good as it looks then this Ford Focus SE is the one! Just what you've been looking for. With quality in mind, this vehicle is the perfect addition to take home. The Ford Focus SE will provide you with everything you have always wanted in a car -- Quality, Reliability, and Character. WHY BUY FROM BLACKSTOCK FORD LINCOLN Our motto is "You Drive Us To Be Different" What does different mean? Live Market pricing competing fairly with integrity Readers Choice Multiple Year Winner Best New Car Dealer, Used Car Dealer, Auto Service Centre for Dufferin County The purchase price is just the beginning. We do not sell or recommend Protection Products that do not have integrity. We do not sell Rust Modules, only Rust Check Spray. The products we do offer, we do not hire third parties. We are direct and approved centre for 3M Paint Protection Film and Ceramic Window Tint. GTechniq Smart Surface Science for Paint and Interior Surfaces We do not sell any product or warranty that we have a hidden ownership stake in. Financing and Leasing Solutions that offer the best rates available that treat everyone fairly and with integrity. Used Vehicle Reconditioning that goes well beyond safety standards. Example brakes with at least 40% wear remaining (Certified Pre Owned 50%). We only offer Extended Service Plans from Ford Motor Company. FINANCING AND CREDIT - Our credit team will work hard to secure you the most favourable terms for you. Your privacy is assured and regardless of your credit rating , simply click the Get Financing Button for a pre-approval quickly and easily. Everyone who handles your application is licensed by OMVIC , the Ontario Motor Vehicle Industry Council. Blackstock Ford Lincoln is honored to present a wonderful example of pure vehicle design... this 2013 Ford Fusion SE only has 201,974km on it and could potentially be the vehicle of your dreams! Just what you've been looking for. With quality in mind, this vehicle is the perfect addition to take home. You've found the one you've been looking for. Your dream car. The Ford Fusion SE will provide you with everything you have always wanted in a car -- Quality, Reliability, and Character. You can finally stop searching... You've found the one you've been looking for. WHY BUY FROM BLACKSTOCK FORD LINCOLN Our motto is "You Drive Us To Be Different" What does different mean? Live Market pricing competing fairly with integrity Readers Choice Multiple Year Winner Best New Car Dealer, Used Car Dealer, Auto Service Centre for Dufferin County The purchase price is just the beginning. We do not sell or recommend Protection Products that do not have integrity. We do not sell Rust Modules, only Rust Check Spray. The products we do offer, we do not hire third parties. We are direct and approved centre for 3M Paint Protection Film and Ceramic Window Tint. GTechniq Smart Surface Science for Paint and Interior Surfaces We do not sell any product or warranty that we have a hidden ownership stake in. Financing and Leasing Solutions that offer the best rates available that treat everyone fairly and with integrity. Used Vehicle Reconditioning that goes well beyond safety standards. Example brakes with at least 40% wear remaining (Certified Pre Owned 50%). We only offer Extended Service Plans from Ford Motor Company. FINANCING AND CREDIT - Our credit team will work hard to secure you the most favourable terms for you. Your privacy is assured and regardless of your credit rating , simply click the Get Financing Button for a pre-approval quickly and easily. Everyone who handles your application is licensed by OMVIC , the Ontario Motor Vehicle Industry Council. Thank you for your interest in one of Blackstock Ford Lincoln's online offerings. Please continue for more information regarding this 2018 Ford Fusion Hybrid Titanium with 35,381km. This is about the time when you're saying it is too good to be true, and let us be the one's to tell you, it is absolutely true. This is the one. Just what you've been looking for. There is no reason why you shouldn't buy this Ford Fusion Hybrid Titanium. It is incomparable for the price and quality. Based on the superb condition of this vehicle, along with the options and color, this Ford Fusion Hybrid Titanium is sure to sell fast. WHY BUY FROM BLACKSTOCK FORD LINCOLN Our motto is "You Drive Us To Be Different" What does different mean? Live Market pricing competing fairly with integrity Readers Choice Multiple Year Winner Best New Car Dealer, Used Car Dealer, Auto Service Centre for Dufferin County The purchase price is just the beginning. We do not sell or recommend Protection Products that do not have integrity. We do not sell Rust Modules, only Rust Check Spray. The products we do offer, we do not hire third parties. We are direct and approved centre for 3M Paint Protection Film and Ceramic Window Tint. GTechniq Smart Surface Science for Paint and Interior Surfaces We do not sell any product or warranty that we have a hidden ownership stake in. Financing and Leasing Solutions that offer the best rates available that treat everyone fairly and with integrity. Used Vehicle Reconditioning that goes well beyond safety standards. Example brakes with at least 40% wear remaining (Certified Pre Owned 50%). We only offer Extended Service Plans from Ford Motor Company. FINANCING AND CREDIT - Our credit team will work hard to secure you the most favourable terms for you. Your privacy is assured and regardless of your credit rating , simply click the Get Financing Button for a pre-approval quickly and easily. Everyone who handles your application is licensed by OMVIC , the Ontario Motor Vehicle Industry Council. Blackstock Ford Lincoln is pleased to be currently offering this 2014 Honda CR-V EX with 82,513km. Want more room? Want more style? This Honda CR-V is the vehicle for you. This is about the time when you're saying it is too good to be true, and let us be the one's to tell you, it is absolutely true. The quintessential Honda -- This Honda CR-V EX speaks volumes about its owner, about uncompromising individuality, a passion for driving and standards far above the ordinary. Just what you've been looking for. With quality in mind, this vehicle is the perfect addition to take home. WHY BUY FROM BLACKSTOCK FORD LINCOLN Our motto is "You Drive Us To Be Different" What does different mean? Live Market pricing competing fairly with integrity Readers Choice Multiple Year Winner Best New Car Dealer, Used Car Dealer, Auto Service Centre for Dufferin County The purchase price is just the beginning. We do not sell or recommend Protection Products that do not have integrity. We do not sell Rust Modules, only Rust Check Spray. The products we do offer, we do not hire third parties. We are direct and approved centre for 3M Paint Protection Film and Ceramic Window Tint. GTechniq Smart Surface Science for Paint and Interior Surfaces We do not sell any product or warranty that we have a hidden ownership stake in. Financing and Leasing Solutions that offer the best rates available that treat everyone fairly and with integrity. Used Vehicle Reconditioning that goes well beyond safety standards. Example brakes with at least 40% wear remaining (Certified Pre Owned 50%). We only offer Extended Service Plans from Ford Motor Company. FINANCING AND CREDIT - Our credit team will work hard to secure you the most favourable terms for you. Your privacy is assured and regardless of your credit rating , simply click the Get Financing Button for a pre-approval quickly and easily. Everyone who handles your application is licensed by OMVIC , the Ontario Motor Vehicle Industry Council. Blackstock Ford Lincoln is pleased to be currently offering this 2016 Lincoln MKX Reserve with 82,020km. With this exceptional SUV, you'll get "sport," "utility," and comfort. Pull up in the vehicle and the valet will want to parked on the front row. This Lincoln MKX is the vehicle others dream to own. Don't miss your chance to make it your new ride. Enjoy driving? Well now you will get more thrills behind the wheel thanks to the heightened performance of AWD. Better handling. Better traction. Better driving experience. Based on the superb condition of this vehicle, along with the options and color, this Lincoln MKX Reserve is sure to sell fast. WHY BUY FROM BLACKSTOCK FORD LINCOLN Our motto is "You Drive Us To Be Different" What does different mean? Live Market pricing competing fairly with integrity Readers Choice Multiple Year Winner Best New Car Dealer, Used Car Dealer, Auto Service Centre for Dufferin County The purchase price is just the beginning. We do not sell or recommend Protection Products that do not have integrity. We do not sell Rust Modules, only Rust Check Spray. The products we do offer, we do not hire third parties. We are direct and approved centre for 3M Paint Protection Film and Ceramic Window Tint. GTechniq Smart Surface Science for Paint and Interior Surfaces We do not sell any product or warranty that we have a hidden ownership stake in. Financing and Leasing Solutions that offer the best rates available that treat everyone fairly and with integrity. Used Vehicle Reconditioning that goes well beyond safety standards. Example brakes with at least 40% wear remaining (Certified Pre Owned 50%). We only offer Extended Service Plans from Ford Motor Company. FINANCING AND CREDIT - Our credit team will work hard to secure you the most favourable terms for you. Your privacy is assured and regardless of your credit rating , simply click the Get Financing Button for a pre-approval quickly and easily. Everyone who handles your application is licensed by OMVIC , the Ontario Motor Vehicle Industry Council.